Teaching in the Tropics: When teaching doesn't seem to "come naturally"
When teaching doesn't seem to "come naturally"
Today I'm blogging about a topic that hits really close to home for me. Like many other teachers out there, I have always been a bit of a perfectionist and overachiever. I was the girl who erased one word ten times so she could write it better than the last time, who untied and retied the sash on her dress until the bow was perfectly symmetrical, who sharpened her pencil just a little longer so it was perfectly sharp. Doing well in school came naturally to me and although I worked hard, I usually didn't have to try too hard to excel academically. When I started college, I was certain I wanted to be a teacher. There was no other option; I knew that was what I was meant to do. I did well in my education classes and felt that I was well on my way to becoming an awesome teacher. Flash forward to my senior year, when I got my student teaching placement in a kindergarten classroom. I had an amazing cooperating teacher and an adorable, eager group of 5-year-olds. It was exactly what I had hoped for and I couldn't wait to start teaching. Finally, the time came for me to take over as student teacher. I wrote my lesson plans (super thorough and detailed, of course), submitted them, and prepared for my lesson. But when I started teaching the lesson, things didn't exactly go according to plan. I remember thinking things like, What do I do when they all raise their hands? This isn't on my lesson plan... What I didn't realize is that I couldn't possibly anticipate how the students would react and respond to every part of my lesson. It was a major reality check for me - the idea that what seemed like the "perfect lesson" might not turn out that way after all. Over the weeks that followed, I often questioned myself as I was teaching with thoughts like, What should I do now? How do I respond to this? I didn't have much confidence in myself and it was obvious to my cooperating teacher and - though I didn't realize it at the time - my students. There were days when I wondered if this was really what I was meant to do with my life. After all, how could I possibly have a career doing something that I'm not "naturally good at"? I remember many conversations with my cooperating teacher about my struggles where I admitted I felt inadequate and that she made it all look so easy. She always told me to have more confidence in myself, keep trying, and to remember that it would take time. Almost three years later, I am still working at it. I have improved in many areas, but still have weaknesses and goals I am working towards. Even now, my perfectly planned lessons rarely turn out as flawless as they appear on the sheets of freshly printed paper in my lesson plan binder. And that's okay. Will teaching ever "come naturally" to me? I don't know. But what I do know is that I won't stop working on becoming the best teacher I can be. It has taken some time, but I can honestly say that I am grateful for the struggles that I once resented. They may not make my job easy, but they force me to work harder, to be patient, and to persevere daily. In a world where teacher blogs are popping up everywhere, it is easy to get caught up in the idea of perfection and inadequacy. However, what we don't realize is that we often only see snippets of the really good days in that classroom. Every teacher has struggled or is struggling with something. I have learned in my short time as a teacher that teaching is not about perfection, but rather passion. So let's continue to be passionate and real about what we do. Let's not only share the successes in our classrooms, but the struggles too. Most importantly, let's continue to encourage and lift each other up every day. Thanks for sharing this. 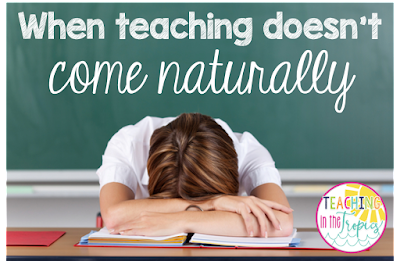 I've been teaching for 18 years, and there are still days when it doesn't feel like it comes naturally! I remember what a terrible job I did student teaching, and I'm amazed at what I've learned over the years. Still, every day in the classroom isn't perfect. It's wonderful that you shared the reality that teaching is a hard job to do well. I agree that passion and a determination to be better each year are the important ingredients to success. Have a wonderful week!